Jack Atlas is the number one ranked turbo duelist in the world – known by his adoring fans as the “Master of Faster!” He’s cocky, self-centered, and has an ego that rides shotgun to his number one status. Stacked with a powerful deck and unbelievable ride, Jack now finds himself dueling circles around the competition in the KaibaCorp Speed World Dueling Circuit. 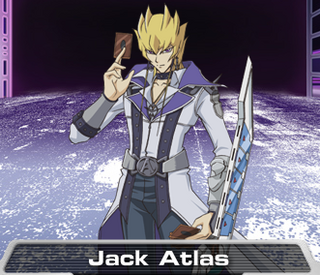 Jack Atlas appears as the Turbo Duel Champion and Yusei’s former best friend in Satellite. He first appeared in the first episode dueling Hunter Pace in a Turbo Duel and wins. 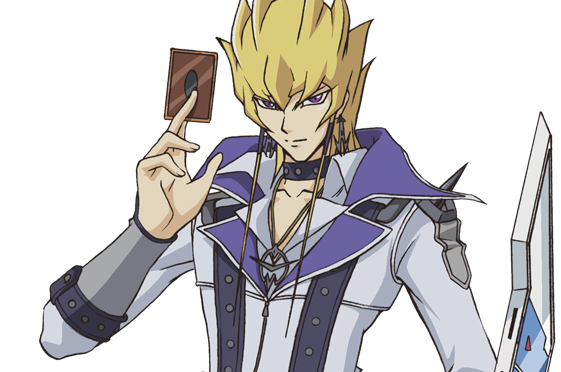 He appears to be overconfident in his duels and mostly declares himself as the only ‘King of Duelists’. Prior to the series start, Jack lived in the Satellite, often wanting more, but still protecting people in need. He was a member of the Enforcers with Yusei, Crow and Kalin, but leaves alongside Crow when Kalin becomes more sadistic. One day, Lazar approaches him with the offer of fame and luxury in Neo Domino City, provided that he brings the ‘Stardust Dragon’ card owned by Yusei. He accepts the offer by attempting to drown Rally, sending him out to sea and giving Yusei the choice of either saving him, or defending his card. In the end, Jack’s plan to drown Rally fails, but Jack leaves with his Duel Runner and Stardust Dragon anyway. Two years later, when Yusei challenges Jack to a Turbo Duel for his ‘Stardust Dragon’ card, Jack accepts and brings him to the ‘Duel Stadium’, with Rex Goodwin, Lazar, and Mina watching them in the monitor room. After the Crimson Dragon appeared in the middle of the duel, both Jack and Yusei fell off from their duel runners and were surprised as they revealed to each other their dragon mark. After the incident from the ‘Duel Stadium’, he found out that Goodwin had been watching his duel with Yusei, and after Jack saw the last card he played (“Meteor Stream”), Jack believed that he had lost to Yusei. Prior to the Fortune Cup, he returns the Stardust Dragon to Yusei. He faced him at the end of the tournament and lost the duel. When asking Yusei how he could lose to him twice, Yusei replied to him that his pride of being King is what led him to his defeat. Jack ends up hospitalized due to his injuries suffered during the duel but leaves his bedroom before being completely healed and is forced to face a brainwashed Trudge who was turned into a Dark Signer. As his right arm was not still recovered, he asks for Carly’s help to draw and hold his cards for him, and together they manage to defeat Trudge. He ends up counting with Carly’s help once more to evade the crowd waiting for him at the hospital’s door. He decides to stay with Carly, despite Mina asking him to come home. Then after spending some time in the city with Carly, contemplating his actions up until now, he decides to throw away his title as King and find his own path. When Yusei is caught up in a duel with Kalin Kessler, Mina arrives and takes Jack and Carly to the scene. Afterwards, Jack returns to Neo Domino City, telling Carly not to get involved in the Signer battles. When Dark Geoglyphs appear in the city, Jack rides towards the action in order to investigate. He arrives at the Arcadia Movement’s tower where he sees Leo, Luna, Yanagi and Bolt Tanner, who had just escaped after witnessing the duel between Akiza and Misty. He goes inside and is able to help Akiza, but then notices Carly’s broken glasses on the floor, realising she was there too. He calls for her, but is unable to find her. When the Signers are united, they go to Goodwin to ask about the Dark Signers. Since Goodwin is unsure of what happens to those sacrificed for Earthbound Immortal summons, Jack is worried about Carly’s whereabouts, which lead to his reason to fight the Dark Signers. He also learns that Dark Signers are those resurrected from death. He later learns that Carly had, in fact, become a Dark Signer and decides to duel her to find out how she became one and since she guards the Aslla Piscu Enerdy control unit. When he duels her, he is initially reluctant to put up a defense. However he starts to fight back in order to stop himself from losing. Whilst dueling, Carly shows him a vision that if he were to be defeated, he would be revived by her as a Dark Signer, and he would rule as the Dark King with her at his side. However, noticing Carly’s glasses, Jack decides to fight in order to bring out the true Carly, using a trap that lets her decide the outcome. He manages to get through to her, but the Earthbound Immortal possesses her, forcing the duel to continue. Facing against her Aslla Piscu, Jack confesses his feelings for Carly, and it allows him to gather the power of the birthmarks, letting him summon Savior Demon Dragon. Carly’s spirit asks Jack to end the duel for her, and even though he protests, he complies with her wishes. He tries to end the game in a tie, hoping to die along with her, but the true Carly activates a trap that just causes her to lose. In the end, Jack holds on to Carly tight while she turns to dust, right after she tells him she loves him. He then goes on to assist Yusei and Crow in a duel against Goodwin; their victory revives the Dark Signers, including Carly, and removes their memories of their time as Dark Signers. Carly’s feelings for Jack, however, remain intact. Jack Atlas runs a Red Demon deck, which focuses on quickly Synchro summoning his ace monster “Red Demon Dragon” (called Red Dragon Archfiend in the dubbed version) and mainly devotes its resources to performing grandiose displays with the purpose of making duels more entertaining for the audience. He also plays monsters that focus on dealing Piercing Damage, or generally speaking, as seen in the namesake of his deck, punishing defensive play. In his duel against Carly, he plays monsters that can be special summoned during direct attacks. Like Yusei, Jack has two decks; one for Turbo Duels, one for normal Duels. Like Yusei, his emotions allows him to harness the birthmark’s power and gain an additional Tuner monster, letting him synchro summon Saviour Demon Dragon. In the Jump Festa special, he uses a card called “Assualt Mode Activate” to further power his Red Demon Dragon to Special Summon his “Red Demon Dragon/Assualt Mode.” However, this is non-canon to the main story. When Jack and Yusei meet again after many years, Jack reveals the duel runner he stole was junked a long time ago. His replacement is called ‘Wheel of Fortune’ and has a gyroscopic appearance. After crashing it in the Fortune Cup following his duel with Yusei, it was rebuilt with additional specs in order to combat the Duel Runners of the Dark Signers.